I had a post in mind I was going to write but decided to save it for next week. Instead I decided to just write about what a great day I had yesterday, and more importantly, what a great day my wife and kids had. Yesterday, I woke up early like I would any Saturday morning. The two to three hours of complete quietness in my house is something I look forward to each weekend. A cup or two of hot coffee and time alone to read or write is my weekend morning routine. I did have an hour to myself but had to wake my eleven year old up at 6:15 so he could be at his school by 7:40. My wife, who loves sleeping in on the weekends, also got up so she could see him off. 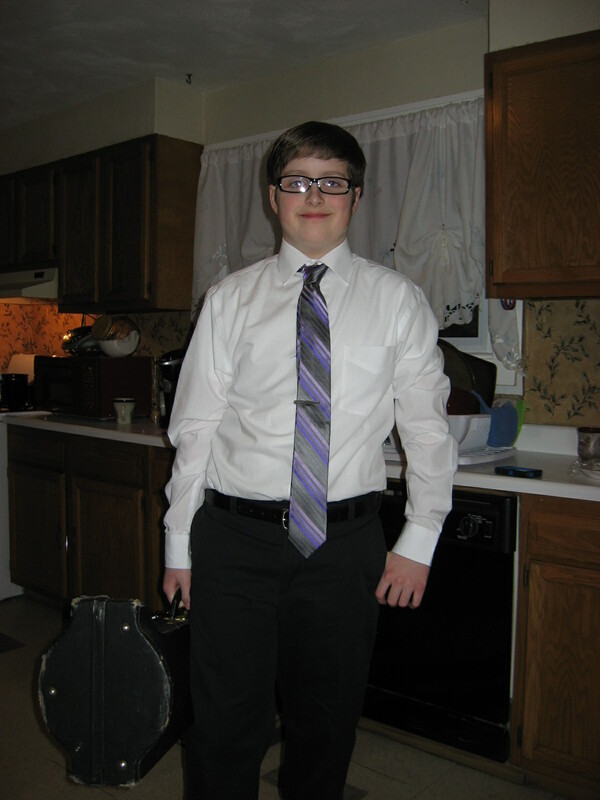 He and a few of his classmates were selected to perform at our All-County Honors Festival along with a number of other kids from neighboring towns. The festival showcases a string ensemble, a show choir, and an intermediate band. My son plays trombone. The plan was to get him dressed in concert attire, let my wife take a few pictures of him, and then drive him into town to catch the bus with his classmates. Concert time was 2:00 so I would still have time to spend with my wife, leave early to pick up my eldest who had spent the night with a friend of his in a small city about forty five minutes from us, then drive another forty five minutes to the small town where the concert would be held. No problem. Okay, not entirely true. If you read my post a few weeks ago HERE you’d know my wife had foot surgery and few medical hiccups as a result of that surgery. Her healing has been slow but headed in the right direction. She still is not allowed to have any weight bearing on the foot she had surgery on so her mobility is limited to a wheelchair, a walker, and as of this last week: crutches. She has been off of work since her surgery back in early December and she only gets out of the house once or twice a week for doctor visits. We live out in the country and do not have a wheelchair friendly entrance to the house. We have steps and this creates a minor problem, strike that, more of a challenge in getting her from the house to the car and back. It’s worse with snow or ice on the ground but we work through it. When I got home from dropping my son off, my wife had decided she was not going to miss his concert. Her original plan was to stay home and work on a scrapbook to give as a gift to a pregnant co-worker but she ran out of some type of tape and glue drops. How, I don’t know considering the amount of scrapbook supplies she has. She also wondered if we could stop by a store either before the concert or after so she could get the supplies she needs (most likely because I could not possibly figure out what she needed nor would I have the patience). We got ready, successfully completed our challenge of getting her in the car, and headed northeast on back country roads to pick up my eldest. After picking him up and stopping to get us all something to drink, we took the freeway west to make up some time before jumping back onto to another country road to head north. My wife was texting our son to find out if we were any stairs to get to the auditorium. He replied that he didn’t think so. We were hoping he was right. I made up some time only because my wife was sitting in the back seat instead of the front where she usually glances at the speedometer and tells me to slow down. Mistake on my part. 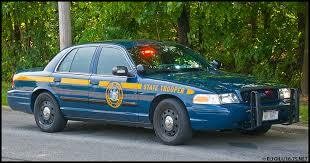 I was driving around 75 MPH when I happened to see a NY State Trooper parked in the median area on one of those turnaround spots nobody is allowed to use. I passed by him, quickly slowing down as I did. I glanced in the rear view mirror only to see him pull out and on to the freeway, accelerating towards us. And then came the lights. Great. We are already running late, my wife and eldest are now scolding me for not paying attention to how fast I was going, and my heart is racing in anticipation of how much a speeding ticket is going to cost in 2015. My last ticket was seventeen years ago and I was already factoring inflation into the amount. I was thinking that I am screwed. When the trooper approached our vehicle, I rolled the window down and he introduced himself and told me why he pulled me over (in case I didn’t know). He asked for my license and registration and for about ten seconds I was thinking of something clever to say such as “Hey, I’m writing a novel and one of my main characters is a NY State Police Detective” or “I’m writing a novel and one of your co-workers is helping me with some of the technical details” or “We are in a hurry to see my son’s concert.” All would have been true statements but I sat there like an idiot awaiting my fate. He was reading my license and repeated my address to me, asking if that was my current address. I told him it was. Next he asked if I lived just past five corners. I drew a blank for a minute and then realized what he was talking about and replied “yes, we are about a mile down the road from there.” He told me he knew which house we lived in and that he used to live about a half mile down the road from us but moved about a year ago. I instantly remembered that one of my co-workers who lives over the hill from me had mentioned a few years ago that his daughter and son-in-law lived down the road from me and that his son was a state trooper. I asked if he knew my co-worker and he said “yes, he’s my father-in-law.” He smiled, shook my hand, reminded me to slow down in the future, then turned around and walked back to his car. My lucky day? More like small town living and I was grateful. We made it to the concert in time and the one concern we had regarding my wife being able to watch it was of a non-factor. There were no stairs and my wife walked into the auditorium on crutches like a champ while I parked the car. I love live music. Yes, I am an eighties rocker but have grown to love most forms of music. The string ensemble, whose participants included a few talented middle school kids and high school kids, performed Celtic Canon and an amazing version of Eleanor Rigby. My niece, who is in middle school with my youngest, played violin with the group along with one of my oldest son’s friends who played string bass. My youngest also plays string bass in addition to trombone but only started playing it this year. The second group was a show choir and I instantly recognized a few more of my oldest son’s friends. There was a small band of musicians (teachers from around the county), who played for the choir’s performance and two of their songs just happened to be favorites of mine: Faithfully by Journey and Beautiful Day by U2. They did an amazing job with both and to my surprise, the guitar player would have made Neil Schon proud on Faithfully. Last up was the intermediate band, made up of just sixth graders. They played Pulse Pounding, Portrait of a Clown and African Spirit Dance. Usually I can’t see my son playing trombone but we were so far to the right of the auditorium, we had a perfect view of him. These kids played their hearts out and closing my eyes, I would never have guessed that these were sixth graders. Best of the best and my son was so happy that my wife was there to see him perform. Our son got to ride home with us instead of taking the bus, so we took advantage of my wife being out and ventured on to another nearby city. This would allow my wife to pick out scrapbook supplies herself; a big thank you to Walmart for having motorized scooters. We were on a roll and decided to push the envelope a little more when we left Walmart and decided we were going out to eat instead of heading straight home. Nothing fancy but it was the first time my wife has been out to eat since early December. My wife was mobile yesterday which might not seem like a lot, but to her and to my sons and me, it was everything. Thanks Erin! I was very impressed with how good they sounded. I do love small town perks. Speaking of Texas… guess what I will be eating next week. Lovely post Bill and I’m so pleased your wife is getting better even if progress seems slow at the moment. Lucky boy with the state trooper 🙂 I was…ahem…not quite so lucky a while back. Thanks Georgia! I feel lucky, believe me. It did remind me to pay more attention to the speed limit. So many years without a ticket has made me a bit bolder in pushing the speed a bit more than I should.